Pillars of Eternity II: Deadfire is a role-playing video game developed by Obsidian Entertainment and published by Versus Evil. It is the sequel to the 2015’s Pillars of Eternity, and was released for Microsoft Windows, Linux, and macOS in May 2018, and for Nintendo Switch, PlayStation 4, and Xbox One later in 2018. The game was announced with the launch of a crowdfunding campaign on Fig in January 2017, where the game reached its funding goal within a day. Pillars of Eternity II: Deadfire is a role-playing video game that is played from an isometric perspective. Both returning and new companions are available, depending upon the choices made by the player. Companion relationships play a major role in the game. Other than companions, there are four sidekicks that can travel with the player. Unlike the first game, Deadfire features a customizable boat stronghold that serves as both a mobile base for exploring uncharted islands and scripted ship-to-ship encounters. Newer ships can be both bought or stolen from enemies. Crews can also be hired to look over the ship. Class based gameplay returns, however, each class has three sub-classes with unique skills. Wikipedia®. Pursue a rogue god over land and sea in the sequel to the multi-award-winning RPG Pillars of Eternity. Captain your ship on a dangerous voyage of discovery across the vast unexplored archipelago region of the Deadfire. Bend the world to your will, as you explore the depths of infinite possibilities, including detailed character customization, total freedom of exploration, and more meaningful choices at every turn. 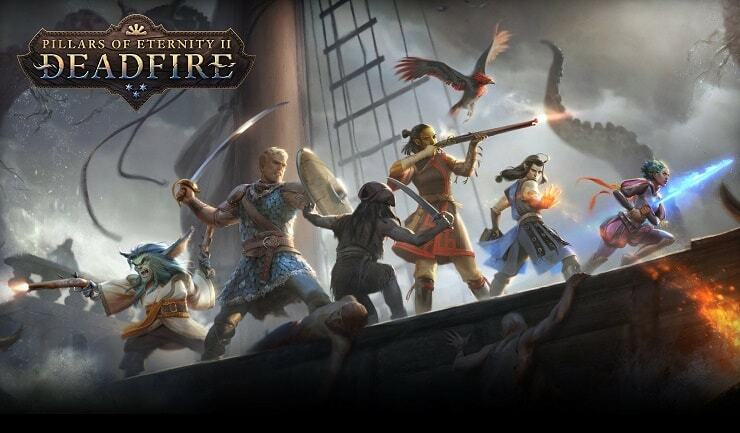 Immerse yourself in a deeper single player RPG game experience – enriched with cutting edge technology and features, Deadfire builds on the foundation of classic D&D gameplay with vastly improved graphics, deeper game mechanics and a whole new hand-crafted adventure where choices truly matter. Discover the new region of the Deadfire – plot your own course by ship and explore the rich and exotic islands of the archipelago region, discovering new places interacting with their inhabitants and engaging in a variety of quests at every port. Build your party and customize your companions – choose from 7 different companions to join you on your quest and assign multiple classes and deeper abilities for each. Witness their personal relationships and interactions unfold with the addition of the new companion system. Trainer for the game Pillars of Eternity II: Deadfire, you can use it to activate these essential Cheat Codes: Infinite Health, Infinite Accuraccy, Super Attack Speed, Stealth Mode, One Hit KIll, Infinite Money, Infinite Experience, Infinite Ammunition, Infinite Repair Supplies. Note: This cheat tool is for the original version v3.0 of the game Pillars of Eternity II: Deadfire.